It's a little-known fact that Thomas Edison, Alexander Graham Bell, Henry Ford, and Steve Jobs were all SEIU members. But Biden is being too modest in leaving out the 18th century. Robert Fulton invented the steamboat and Eli Whitney invented the cotton gin thanks to federal grants provided by earmarks written by a young Sen. Robert Byrd. Great Picture! Smokey and the Biden? The Veep is spot on. Communism, Fascism, Maoism, Stalinism, Prohibition, the Great Leap Forward, Khmer Rouge and the Great Society. P.S. Universal health care couldn't make it but he sends his regards. According to other Dave & Buster's employees, Biden has not historically respected the bans that have been placed on him. 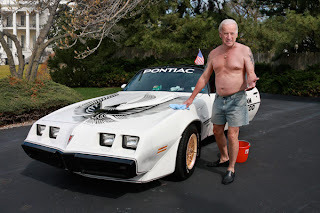 After he was barred from the Tempe, AZ location in 2007, the former senator would reportedly do burnouts in the parking lot with his Trans Am while waiting to pick up a waitress employed there at the time, a woman identified only as "Candi."